I’ve been out and about painting today as I couldn’t resist the sunshine. I’m in dire need now of a cup of tea. I will probably post a photo next week as the paint is drying but here’s a photo in situ and today’s still life. Exciting news, i have arranged to do two full-day workshops with delicious lunch (!) at the gorgeous Rookery Farm Studios, Silverstone in February. Email me if you’d like some info. I did this one as a quick demo a few weeks ago at a workshop. 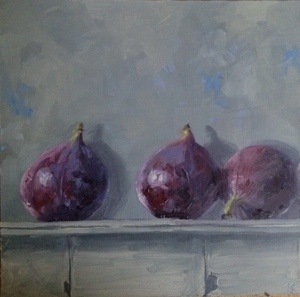 The Aubergine is long gone but the onions are still kicking around looking a bit sad! I’m in Wales today about to set off for a walk on the Gower and to see the venue for next year’s wedding (our firstborn, sniff). Don’t think I will have time to stop and paint as with a group of non-painters but will definitely be sourcing vistas to paint later on next year. Here are some tangerines I did before we left. The good thing about sending out a blog is it gives me an excuse for half an hour on the kitchen sofa. Must try not to nod off…. Ooooo back home. The weather was atrocious but it was good to see my mother-in-law looking so well after a nasty operation, bless her. Looking forward to time in the studio tomorrow but here’s one I did the other day. Back up the m6 today, very windy so blown all over the place. So, here’s another one of tangerines. I always feel a bit Christmassy when I have these in the house. That’s quite enough of that…far too early. As I was pelting up the garden to the studio on Wednesday, trying to avoid a drenching…I spied these lone latecomers in the border. I thought I should show my respect for their stamina by committing them to paint so have spent the past three days on dailies. Here’s the first. Have a good weekend all. Hopes for some plein-air painting dashed again today with a mercy dash to school to pick up a flu-ridden daughter. Ministering to the sick is the order of the day but I did manage a quick daily this morning before I got the call. Fed up with this weather. I need to get out and paint the autumn colours before they fall. Oh well, more figs.